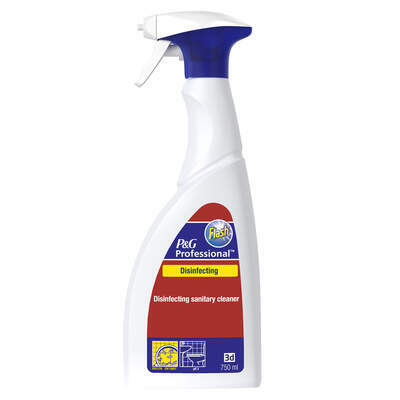 Suitable for the repeated use required in environments such as care homes, this Flash Clean & Shine Bathroom Spray 6 x 750ml is a powerful solution. Developed by a leading expert, this versatile spray has been formulated for the cleaning of washroom floors, tiles, sinks, showers and toilets while helping to achieve a high shine in minutes. Simply spray on to the desired location with the easily functioned nozzle and wipe clean with a cloth to achieve that newly polished finish. The disinfecting bathroom spray brings your washrooms back to the highest levels of hygiene and reduces the risk of cross contamination between residents or guests. Stock up on everything you need to create the cleanest work environments from our Liquid Power Bathroom Cleaner 750ml through to our Soclean Cloths and our Flash All Purpose Cleaner Lemon.